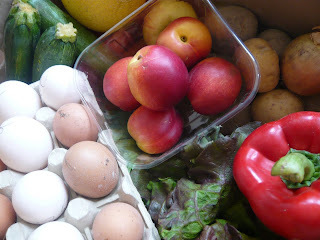 When I got an email from Able and Cole with the offer of a free box of organic veg in exchange for a mention on my blog, my inital reaction was "ooooooooh" with lots of hand clapping because of the magic word. But then a second reaction of "hmmmm" soon followed with lots of chin stroking because I never considered this blog to be a vehicle for reviewing food products as such. The main concern playing on my mind was how honest and subjective could I be when accepting a freebie. Sure you should never look a gift horse in the mouth but remember that horse will need feeding. And let's not forget the fact that I have an allotment just down the road with my own supply of veg and some fruit. Should I really be writing about a service that ordinarily I wouldn't buy into? After much pacing back and forth in my kitchen, with wringing of hands, staring forlornly into space, shaking my head and muttering under my breath, I came to the conclusion that I was a silly sod and should just bloody accept the offer. For one it's my first time, getting a freebie off the back of Food Urchin that is, why shouldn't A&C break my cherry? And if the flood gates open after from this little write-up and I get inundated with offers from across the land then I will have to review the situation, after all no-one likes to be a called a blagger do they. But somehow I can't see that happening. So what did Able and Cole send me in the end and what did I do with it? Well in no particular order, in our box we received some apples, a melon, a punnet of nectarines, a pepper, some potatoes, courgettes, spring greens and some onions, all of which were nice and fresh There were also some carrots which were past their best (rubbery in fact) and a lettuce which was a bit limp although the heat might have had something to do with it. I must admit, not knowing what was going to be in the box does did press on my improvisational skills when I started to think about what to cook. As I peered in and rummaged around, all I can say is thank God I didn't have Ainsley Harriot bearing down on me, gurning like a loon. But seeing as it was all certifiably organic, I decided that majority of the veg would be used to make a couple of meals for the twins who are 14 months old. So in a nutshell, I took the potatoes, spring greens, rubbery carrots, onion and peppers, chopped them up and boiled them until soft, drained them and mashed them and then added some meat from a roast chicken. Genius. 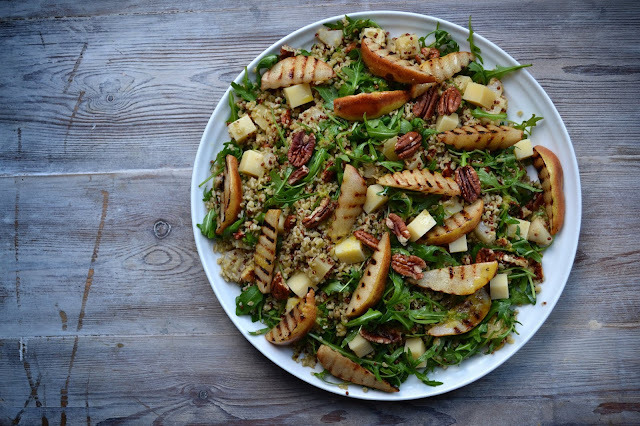 And with the apples, melon and nectarines, well I chopped them up too into tiny pieces and made a fruit salad for them. Again genius. If there's anyone out there who's thinking "blimey, even if you were just cooking for the kids surely you could have been a bit more creative, like that Annabel Karmel for instance". Well I would just like to say that I have one of her books and I wouldn't trust her as far as I could throw her. Yes her recipes are great but she doesn't look like an ordinary mum to me (more Stepford Wife) and she definitely doesn't know how to actually feed a child. Look at the cover of Feeding Your Baby and Toddler for instance, that poor little angel is going to get that spoon right in the eye I can tell you. Besides, at this stage of development, the twins are more interested in throwing the food up the walls, on the floor and wearing their bowls as hats so I'm not going to go all kiddie Cordon Bleu on them just yet. But on licking my glasses after one particularly accurate projectile, I can however testify that the chicken and veg mash did taste good. 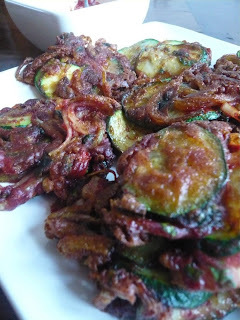 I saved the courgettes for the grown-ups as I've been meaning to try this recipe for Spiced Courgette Fritters ever since I came across it and was quite happy with the result although I could have sliced the courgettes slightly more thinner. Still they would certainly make an unusual accompaniment to any curry. As we always get a glut of them every summer from the allotment, I am always on the lookout for different uses for a zucchini, rather wait till they swell up into watery tasteless marrow so any other suggestions/ideas would be gratefully received. Coming squarely back to A&C then, I suppose the main point is, has this freebie enticed me to use their service again? Well possibly, I will certainly keep an eye on the website to see what veg and fruit they offer over the next few weeks just see how they fair in terms of variety. But in the meantime, I would just like to say thank you Abel and Cole for feeding the dustbin lids for a couple of days, they certainly enjoyed your food, albeit for entertainment value only. Looks like we had carrots from the same manky stock pile! Re your reply on my post! Yeah I don't know whether they will send me any more either. I did take a lot of time over my post and I think I was honest and fair. And I would think the great feedback on the chicken might persuade customers to try their meat range. Seriously guys, I'm getting a complex now. Why wasn't I chosen by Abel and Cole? this post has made me laugh so much I think I'm in danger of being sick. Great post. 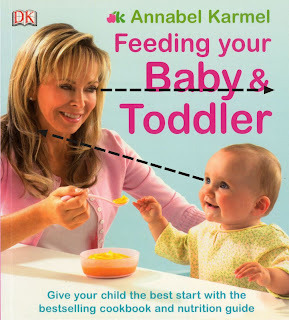 Your retouching of the Annabel Karmel photo is hilarious.